This article addresses the connection between identity, memorialization, and natural resources in the Western Sahara protracted refugee crisis. During the political transition years of 1973, Sahrawi miners extracted the largest amount of phosphates from Fosbucra'a while the Sahrawi separatists—called the Frente POLISARIO—began to campaign for independence. Their hopes were destroyed in 1975 when Spain signed the Madrid Agreements, granting the Kingdom of Morocco authority over the Sahrawi and their natural resources. As this agreement was in direct violation of the 1975 International Court of Justice’s (ICJ) advisory opinion in favor of the Sahrawi, war broke out between Morocco and the newly formed Sahrawi government forcing Sahrawis to flee to refugee camps in Algeria in 1976. This article is organized from 1973-1976, bookended with the two largest acts of sabotage the Sahrawi promulgated against Spain and then Morocco. The centrality of the phosphate mines responds to a lack of legal and historical research addressing the connections between the power dynamics of the colonial administrations, resistance, and natural resources, which continues to impact the landscapes and psychologies of the Sahrawi people in their forty first year of exile. This analysis extends to understanding the current legal structures and local struggles over oil exploration by Moroccan and American companies from 2001 to present, which cannot be understood without a deep grounding in the sale and sabotage of phosphates as this industry has had a profound impact on the Sahrawi independence movement and Moroccan politics. Sarah Gilkerson is interested in Touareg and Sahrawi history, forced migration, the Sahara Desert and Trans-Saharan studies, memory studies and Human Rights, phosphate and uranium mining, International Law and Justice, Refugee History, and Environmental History. As a doctoral student at UC Davis, she has cultivated a relationship between activism and academia while undertaking fieldwork in the Sahrawi Arab Democratic Republic refugee camps in Algeria as well as language immersion and volunteering with Dar Si Hmad in Agadir, Morocco and Tangier, Morocco. She is currently focusing on the history of the Fosbucra’a mines in the Western Sahara and the failed Sahrawi independence movement from Spain and Morocco using both legal hearings and oral testimony. Sarah Gilkerson’s project is a rare piece of interdisciplinary scholarship that is firmly rooted in a multitude of methodologies in an exciting and important way. She devotes obvious intention and commitment to not only the topic of the colonization of the Western Sahara and Sahrawi sovereignty throughout the twentieth century, but to the political process of methodology. This project would not work without the multiple framings she weaves together – memory studies, critical development studies and political ecology, and a decidedly radical historiography (with some established methods given careful attention), among others. She quite adeptly argues that the material and semiotic relationships between phosphate mining, global agricultural economy, decolonization and class consciousness coalesced to shape the Sahrawi national identity in the mid 1970s. She does not resort to a simplistic analysis, neither does she privilege any one element of this collision. Her timeline leading up to the “place-memory nexus” of the Fosbucra’a mine is deeply historical, while making clear the historical traces left on Sahrawi life in exile today. 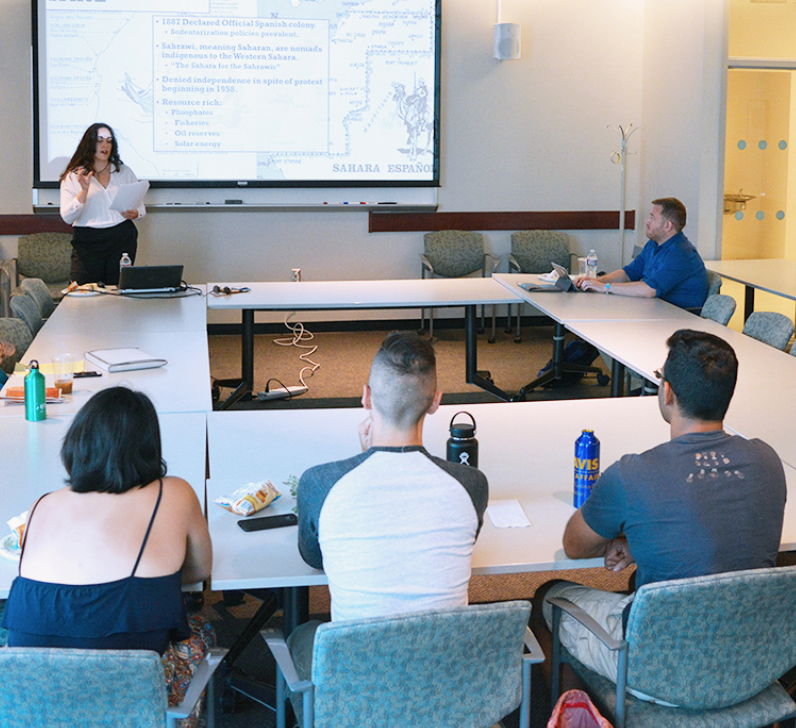 Sarah's historical analysis of the creation of Sahrawi national identity through resistance at a phosphate mine offers us deep context for understanding a largely forgotten conflict that has forced the whole-scale displacement of the people of Western Sahara for the past 42 years. Sarah argues that moments of dramatic resistance against Moroccan control of phosphate mining are crystallized a collective Sahrawi political identity, and ultimately forged a national identity of resistance that had never existed among the nomadic people spread across the vast western Sahara region. 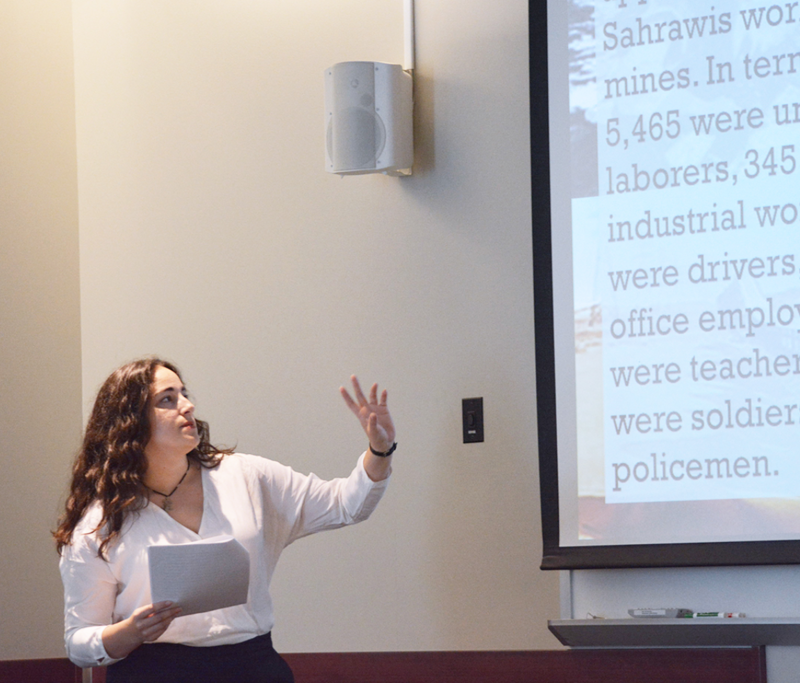 Sarah analyzes the ongoing symbolic significance of disrupting the vital conveyor belt in Fosbucra'a mine by demonstrating how it embodies the historic exploitation of Western Saharan resources not only be Morocco but by the former Spanish colonial regime. In doing so, Sarah offers an intervention in the historical literature and provides a deeply situated reading of the historical process that produced the current conflict. Sarah's history draws attention to the protracted, and still ongoing, postcolonial struggle, and suggests the way contemporary global capital has produced new exploitations as well as new forms of resistance. Sarah's discussion demonstrates how a largely taken-for-granted resource, phosphorous, has become central not only to the formation of Sahrawi political identity but to the self-conception of the Moroccan state. The resource, as a potential basis for continued wealth and state legitimacy, continues to be central to both sides' political ambitions.